Cable Style (Accordion Design) Replacement Tarp. 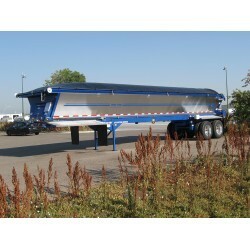 We offer replacement Cable Style (Accordion Design) tarps in mesh or solid vinyl for Dump Trucks and End Dump Trailers. Custom sizes available, tarps made upon request. 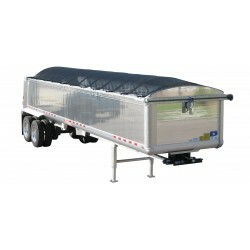 Need the Make, Model of the Truck / Trailer , width of the Truck / Trailer (front, middle and end), the length of the actual truck / trailer. Cable Style Tarp System Brand and rise of the bows used for the tarp (10”, 12”, 18” etc.). To determine your tarp size, measure the existing tarp, for width we would need the dimensions of the tarp from outside (including up & over the bows) to outside, and for length we need the tapered width of the front leader and that length (to the beginning of the widest width) plus the total length from the leader to the end of the tarp (usually the last bow). We also need to know if tarp has a flap on the end and the length of the flap.